Pre-show activities at 1 pm and 6 pm with photo opportunity with Cinderella after the performance. Tickets range from $17 to $37. Day of performance purchase additional $5. Spectacular dancing, a beautiful score by Sergei Prokiev, a generous dose of humor and a treasured fairy tale all combine to make the Springfield Ballet Company’s production of Cinderella a can’t-miss event. Performances will be on Saturday, March 23 at 2 pm and 7 pm at Sangamon Auditorium. Advance tickets range from $17 to $37. Day of the performance tickets are an additional $5. 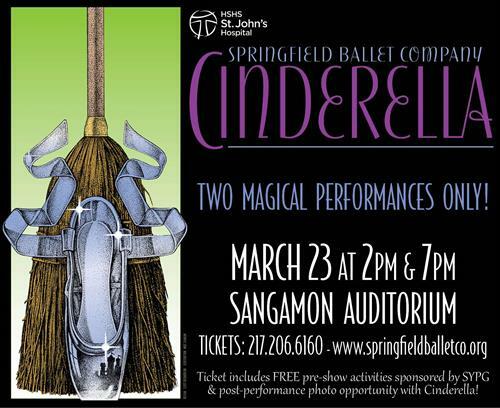 Each ticket includes FREE pre-show activities sponsored by Springfield Youth Performance Group (SYPG) and post-performance photo opportunity with Cinderella! Pre-show activities begin at 1 pm and 6 pm. Purchase your tickets by calling the UIS Performing Arts Center ticket office at (217) 206-6160 or online at uispac.com. Cinderella, sponsored by HSHS St. John’s Children’s Hospital, showcases the talent and diversity of the Springfield Ballet Company members and also features some amazing professional guest artists, local dancers and actors. "Cinderella is perfect for children. It's a beautiful story with a happily-ever-after ending but adults will also love the humor and the romantic story," says Julie Ratz, SBC Artistic Director.